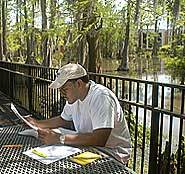 The University of Louisiana at Lafayette’s higher admissions requirements are attracting better prepared high school students and enrollment numbers for Fall 2008 indicate that more students are on track for college success. “ While overall enrollment remains stable, the makeup of the student body is changing in significantly positive ways,” said UL Lafayette President Dr. Joseph Savoie. “Preliminary enrollment for the Fall 2008 semester is 16,320 – a difference of only 25 students from 16,345 in 2007. “ As a result of the university continuing to ratchet up its admission standards, students are progressing toward a degree at a faster rate than in the past,” he continued. In addition to improving undergraduate student success rates, significant growth is occurring in UL Lafayette’s Graduate School. The 2008 enrollment figures show a 9 percent increase in graduate students. That amounts to 119 more students in master’s and doctoral programs, as compared to 2007 figures.